On Wednesday 16th November 2017, Challenger Society participated in a high profile outreach event run by Teentech www.teentech.com - a charitable, education organisation led by Maggie Philbin (from BBC's Tomorrow's World and Bang goes the Theory fame) - at the University of Surrey's Sports Park in Guildford. The TeenTech event at Surrey Sports Park enabled more than 200 Year 8 students (13 year-olds, about to make GCSE options) along with ~100 sixth formers to meet with over 30 companies and organisations. The students participated in interactive activities at each exhibit and could tap into expertise from many different professions, putting the subjects they study at school into the context of exciting careers. The students also had the chance to hear inspirational talks and attend a careers Q&A panel. Representing the Challenger Society, and the wider context of careers in Marine Science and Technology, were Challenger Society council members Louisa Watts (Education & Outreach) and Terry Sloane (Industry Liaison & Technology), helped by Challenger member and researcher Helen Smith (National Oceanography Centre, Southampton). The Challenger team took part in 15 minute back-to-back sessions, meeting students and teachers in groups of 5-6, so allowing good engagement. The team organised a mixed session, starting with timed challenges naming oceans and seas using an inflatable globe, followed by a quickfire fact-finding mission on what the students thought about the oceans. This led onto an animated discussion around current cutting-edge marine science and technology, including hydrothermal vent exploration, (thanks to fantastic imagery from the University of Southampton), and life aboard a Research Ship. The students had the chance to ask questions and find out about the day-to-day activities of marine scientists, engineers and also the roles aboard the Research Ships such as the Merchant Navy, (including the all-important chef!) This segued into the critical role of engineering and technology in marine science, and the skills involved. 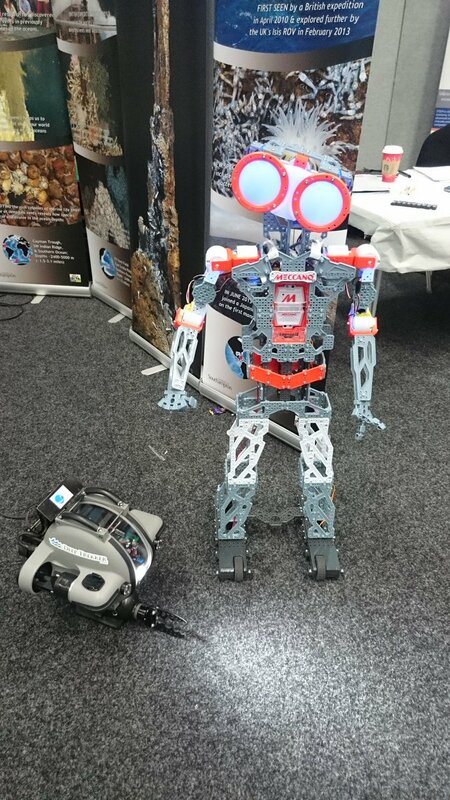 Cutting edge autonomous instruments were demonstrated and the students enjoyed handling a “Deep Trekker” Remotely Operated Vehicle (thanks to Planet Ocean Ltd), learning how to use the hand set and visualisation goggles to try and retrieve samples including manganese nodules and shells. At the end of the sessions the students declared one thing they had learned from the team: responses were wide and varied including the use of ROVs and engineering in taking measurements and collecting samples, the 400 oC heat of the vents, the depth and pressure of the deep oceans, marine life at the vents and new species fuelled by chemicals and bacteria, that “the oceans aren't as boring as I thought”, and that marine biologists do not need to swim to do their research (from the non-swimming budding marine biologist!). Very positive feedback was also received from one school that voted the Challenger Society exhibit and activity the best!